You have a whole community of spirit guides around you to see you through life. Guiding forces have been part of our existence since the beginning of time. Usually, your guides will present themselves in human form, or with a familiar name. Historically, a guide will be of a special culture or ethnic origin, such as Native American, Chinese, Egyptian, Irish, etc. Your guide may have a certain vocational association: physician, musician, professor, healer, etc. Others may present themselves as a color, sound or sensation like royal blue, chimes, north wind. The main reason for this is so to associate with the guiding force in an easier manner. Many people feel more comfortable with the idea of Inner Self or Higher Self. These are wonderful ways of looking at it. Personal Guides~~These guiding forces are around you all your life. It is their mission to assist you in any way needed. They gently nudge you into positive situations. But we don’t always pay attention at the time. You may be attracted to something that represents your guide. This could be a flower, or a rainbow, or a crystal, for example. Guides for Special Gifts or Talents~~These guides may be with you all your life, or only a short period of time. Their main purpose is to help you in an area of expertise, such as, playing the piano, a knack for working with children, or weaving a blanket. Master Teacher or Doctor~~These guides are specifically for your spiritual growth. Many of them help in healing techniques or spiritual counseling. They may also help you in communicating with people or teaching. Before spirit incarnated into the bodies we have now, we decided the experiences we wanted to help our soul evolve. After taking on the physical body, we may be doing other things than our life purpose. This is when your guide will come to influence you and gently urge you onto the path again. He will never tell you what to do or make you do something against your nature. The guide is only there to assist you. You always have free will, and can choose to follow the advice or not. Sometimes loved ones you knew in this lifetime may come to help you. Even though your loved one comes with love and help, the advice she has may not always be helpful. You may have taken Aunt Sue’s advice when you were 10 years old. She is still operating with the same mental capacity. Her spirit has not evolved as greatly as your spirit guides have. Being in the spirit world does not guarantee enlightenment. Better to seek the advice or counsel of a more evolved guide or spirit who can give you a broader look at the problem, rather than a limited earthly view. then you can embrace Aunt Sue for encouragement on the path. I have a very personal opinion of who spirit guides generally are. This is not something any one told me, nor have I learned it in seminars or classes. It is information brought through spirit in many different readings I have goven and other meditative moments. I believe guiding spirits are rerepresentative of previous lives. Imagine a large wagon wheel. The center cog of the wheel represents your life now. This is the one small part of yourself you are right now. The outer wheel represents all you have ever been. And the spokes are different interpretations of lifetimes you have experienced.As you live this present life, you may need help in familiar areas or experiences. Then a past life remembrance is made known to you in the form of a guiding spirit. The essence or spirit of a previous life is always connected to the soul. When the soul realizes you need guidance it provides you with a past life experience through the system of spirit guides. Copyright 2009, Melissa Leath. All rights reserved. 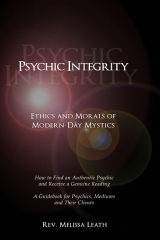 This is an excerpt from Psychic Integrity, Ethics and Morals of Modern-Day Mystics. Are You Out of Body? These days of transitions are surely interesting: Up one day and down the next; in the money one week, broke the next; total comprehension one moment, not a clue the next. Most of us tend to go out of body. We deal with the day-to-day stuff, sure enough. But when it comes to being present and aware, totally in charge of our lives, we just aren’t available. In fact, a large group of us–yes, even the “meta-people”, are electing to float in astral space, than to be present in the physical. Sit quietly for five minutes only paying attention to how your body feels. Do your shoes pinch your feet? Is your waistband too tight? Are you breathing shallowly or in the full abdomen? Are there any aches or pains? Take stock of your body parts…Check in on the liver: what is it saying? Are your lungs in good working order? Are you on good terms with your heart? Now, go to the pile of bills or papers you’ve been collecting. Look at them. Act on them. Make a plan for payment. Make phone calls concerning the bills, if need be. File your papers. Organize or throw away. Take charge of that all important area of your life. This may take several hours. But it helps get you in your body. If you have trouble staying in the task, or you let your mind wander in other directions, then you probably are living most of your life out of body. Usually, a major event that is difficult to deal with, sorrowful or extremely painful will throw you out of body. It’s the ultimate way of disconnecting with the thing that is difficult. Over a period of time, it’s important to deal with the situation. Then you are present and physically aware again. But many of us keep finding ways of not dealing. You may recognize someone around you that is very spacey or in “la-la land”. I’ve heard the discription “she is airy-fairy”. That person has successfully disconnected with physical reality. Some may argue they are striving to be more spiritual and connected with the Spirit Realm. But my question is this: Why bother being in the physical body? Haven’t we agreed to experience the third dimension? Aren’t we spirit–being humans? Then it is important to blend the three aspects of self: body, mind and spirit. We become a whole person, perceiving reality–totally perceiving reality. Tim Burton, director and producer of memorable movies such as, Sleepy Hollow, Big Fish, Charlie Wonka and the Chocolate Factory and Beetle Juice, has pushed a great intellectual story to its edge, both visually (3-D, and in realist terms) and metaphysically. Many paranormal and psychotronic gurus have dissected the plot and symbolism of Alice in Wonderland for many years. The story speaks to us on a much deeper level. Going down the rabbit hole, is a huge metaphor relating to retreating into the unconscious, or dream world. The descent is associated with the land of the Goddess, under the forest and streams. The farther she falls, the deeper Alice goes into the subconscious mind and slowly looses the ability to discern reality from illusion. Needing a gold key to go through a special door, following the White Rabbit, represents a search for spiritual truth. The rest of the story is a continuation of that search: Something that is becoming more important for us to recognize, every day. As the movie presentations this year move into more and more 3-D technology, the spiritual and metaphysical world opens up to us. The 3-D door actually helps us shift into the realization of multi-dimensionality. We expand our perception, and look at things in a new angle. It’s about time we opened our eyes to what is illusion and what is reality. Those who have eyes will see; those who have ears will hear. 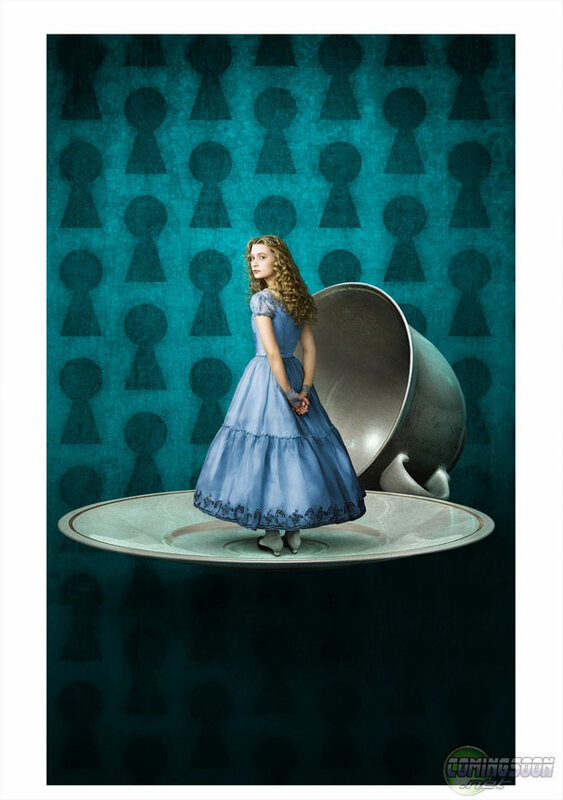 This version of Alice in Wonderland, I predict, will be one of the highlights of this year, spiritually speaking, since the fascinating and mystical Avatar. And many of our younger generation will “see” and “hear”. Due to be released on March 5, 2010, check it out. I certainly am.